There are ingredients in many products that we might want to avoid and dentistry is no exception. Some of these ingredients such as artificial sweeteners are controversial in terms of proven harm. In other cases, it is an issue of sensitivity or an allergy. Some people find they are sensitive to specific ingredients while others have no problems with dental ingredients but still want to avoid them out of concern. The use of sweeteners in toothpaste has mainly come about as a response to the concerns over sugars and their effect on dental health. On the flip side, there are also complaints and concerns about the effects of sweeteners on the rest of the body. One artificial sweetener often used in toothpastes is sorbitol. It can, however, have a laxative effect. This could be worrisome for those most likely to be ingesting toothpaste, such as children. Artificial sweeteners have been anecdotally linked with symptoms such as headaches and nausea. Most experts do not, however, believe they pose a health threat in dental products. There is not any harm in avoiding them if you do have concerns though. Many toothpastes will contain dyes. This is particularly true of products geared for children, where the bright colours are thought to make the toothpaste more appealing. Some of the dyes are inevitably swallowed even after spitting out toothpaste. If you are one of the small number of people who suffer from allergic reactions to the dye, then it is best to avoid coloured toothpastes. Other complaints may include headaches from dyes. This chemical is one of the substances that help toothpaste foam up when you brush your teeth. One study linked it with ulcers in the mouth. Some national recommendations support its use while others recommend alternative substances. Even though fluoride is a naturally occurring substance, some people choose to avoid it due to concerns about its effects on health. A certain amount of fluoride is absorbed into the body due to it being ingested when brushing as well as through some water supplies. It is, however, recommended by most national dental associations for its beneficial effects on teeth. Young children should still be supervised when brushing to ensure they spit. 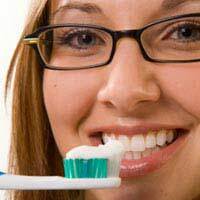 If you prefer, there are many natural toothpastes on the market today that can do an excellent job of cleaning teeth. They tend to come infused with natural oils and antibacterial substances such as tea tree oil to help prevent tooth decay. In westernised countries such as Britain, we have rules and regulations for health and safety when it comes to dental products. Some people, however, have questions around how ingredients are evaluated and are mistrusting of the process by which they are approved. You will have to decide which ingredients pose a risk or could potentially harm your health. This decision may be based on your own reading and media or personal sources. Alternately, you might use your body's reaction to an ingredient to guide your conclusions. Whatever your choice, make sure it is an informed one that helps your oral hygiene and overall health.